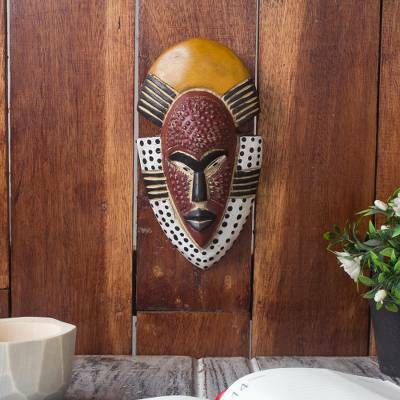 You can find african wood mask 'Ghana's Happiness' by Saeed Musah in masks categories such as Ghanaian Masks, Nat Geo Decor Masks, Wood Masks and Metal Masks. Enjoy exploring these sections for other Novica treasures. "Great mask, made a great gift"
I was drawn to this mask's color combo as it would work well in a friend's dinning room. They have just returned from an African trip and brought back some wonderful paintings and linens they planned on using in the dinning room. This mask was very well received and looks great in the newly remodeled room. This mask came in perfect condition and in a very timely manner It is very beautify,. I love the colors and the carving. I can't wait to hang it so we can all enjoy it. I brought back wonderful memories of our time in Ghana. Really great, exactly as it appears on the web site. My son now wants to purchase some. I will most likely purchase more. This mask was a unique gift I gave at Christmas to my son. The mask has earthy colors and a real joy to study! This was a perfect gift for the thoughtful and artistic! "Spiritual Guide in my life"
It's a beautiful piece of art work with positive meaning. Everyone that sees this in my home loves it.